Home to roughly 36,000 residents in 2010, Menomonee Falls is Wisconsin’s most populous village. Located approximately fifteen miles northwest of Milwaukee in WAUKESHA COUNTY, the settlement was named for the Menomonee River, a tributary of the MILWAUKEE RIVER. Native Menomonee people inhabited the area before white settlement, which began in earnest after 1840; the village officially incorporated in 1892. Throughout the late nineteenth and twentieth centuries, Menomonee Falls combined small-town living and civic engagement with economic growth in manufacturing, healthcare, and retail services. In the 2000s, the village attracted new businesses while strengthening communal ties through voluntary associations, a farmer’s market, and events like the Fishing Derby and Chilly Fest. Settlers William Hesk and Frederick Nehs helped build Menomonee Falls’ early infrastructure. Hesk opened its first post office in 1842, while Nehs constructed a thriving limestone mill. A migrant from Pennsylvania, Nehs used his water-powered mill to pulverize limestone into building mortar and plaster. At first, teamsters transported the finished product to Milwaukee; however, rail soon dominated the area’s shipping needs. Other key businesses founded during this era include Farmer’s and Merchant Bank, The Menomonee Falls News, and Lohmiller’s Drug Store. In addition, the Menomonee Falls Foundry Company (founded 1880) engineered plows, cultivators, and other farm implements. In the early twentieth century, the Wisconsin Sugar Company became the village’s first multi-million dollar enterprise. Between 1910 and 1918, its beet sugar refinery generated almost fifteen million pounds of sugar annually, with as many as five hundred laborers, including women and children, working peak seasons. Following World War II, Stolper Industries signified Menomonee Falls’ postwar prosperity, wholesaling steel to various construction and agricultural equipment manufacturers until 1987. Moreover, KOHL’S CORPORATION has bolstered the village’s reputation as a place for big business since the 1980s, housing the retail giant’s corporate headquarters and, from 1981 to 2010, a 530,000 square foot distribution center. An assortment of religious institutions, voluntary associations, and public coalitions has served Menomonee Falls since its founding. The organization of churches like Emmanuel Evangelical (1846), St. Mary’s (1904), and Grace Lutheran (1933) helped establish social order and stability for a culturally diverse community of GERMAN, IRISH, ENGLISH, POLISH, ITALIAN, and NORWEGIAN American residents. Likewise, villagers introduced local chapters of groups like the International Order of Good Templars, the Masonic Lodge, the General Federation of Women’s Club, the Chamber of Commerce, the American Legion, and the Boy and Girl Scouts of America. In 1938, developer A.T. Jacobson helped usher in the region’s SUBURBANIZATION with the construction of fifty-eight houses. Built on the Shunk and Benstein farms, Hiawatha Heights became Wisconsin’s first subdivision approved by the Federal Housing Authority, with ninety-five percent of homebuyers relocating from Milwaukee. Although the village’s population declined from roughly 32,000 to 27,000 between 1970 and 1990, low tax rates, a first-rate medical center at Community Memorial Hospital, 3,700 acres of conserved green space, and Menomonee Falls’ standing as one of the “safest cities in America” have attracted thousands of new residents in the 21st century. ^ Lawrence S. Barish, ed., State of Wisconsin 2007-2008 Blue Book (Madison: Wisconsin Legislative Reference Bureau, 2007), 756. ^ “Looking Back at Menomonee Falls’ Past,” Menomonee Falls Historical Society Newsletter (April 2012). ^ The Village of Menomonee Falls, Wisconsin, “Menomonee Falls Video Tour Book,” accessed June 14, 2013. ^ Menomonee Falls Chamber of Commerce, History of Menomonee Falls (Menomonee Falls Chamber of Commerce, 1950), 7-9. ^Allen Johnson and Viola E. Ruby, Photographs and Memories: A Pictorial History of Menomonee Falls, Wisconsin (Menomonee Falls: Menomonee Falls Historical Society, 1977), 3-6. ^ Menomonee Falls Chamber of Commerce, History of Menomonee Falls, 13-15; “Leading Industries,” The Milwaukee Sentinel, July 16, 1919, 9. ^ Johnson and Ruby, Photographs and Memories, 51. ^ “Stolper Industries to Close Menomonee Falls Plant,” The Milwaukee Journal, May 19, 1987, 4C; “Stolper Steel Plans Complete, Removal to Menomonee Falls,” The Milwaukee Sentinel, January 15, 1950, 5. ^ Doris Hajewski and Don Walker, “Kohl’s to Close Menomonee Falls Distribution Center,” The Milwaukee Journal Sentinel, October 13, 2009; Jay Sorgi, “Kohl’s to Close Falls Distribution Center,” Today’s TMJ 4, http://www.todaystmj4.com/news/local/64078427.html, accessed August 26, 2013. ^ Menomonee Falls Chamber of Commerce, History of Menomonee Falls, 23-25. ^ “Jacobson to Start on 300 More Homes,” The Milwaukee Sentinel, September 24, 1939, B14; Johnson and Ruby, Photographs and Memories, 91. 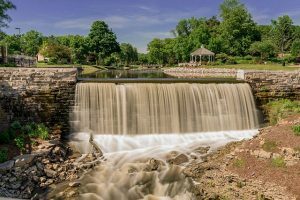 ^ Amy Rinard, “Most of County Sees Growth in Population,” The Milwaukee Journal Sentinel, June 24, 2004, 1B; City-Data, “Menomonee Falls, Wisconsin,” accessed April 16, 2013; Danielle Switalski, “Falls Named One of America’s Safest Cities,” Menomonee Falls Now, February 19, 2013; Joe Manning, “Community Memorial Plans Big Expansion,” The Milwaukee Journal Sentinel, January 15, 2001, D1. Johnson, Allen, and Viola E. Ruby. Photographs and Memories: A Pictorial History of Menomonee Falls, Wisconsin. Menomonee Falls: Menomonee Falls Historical Society, 1977. Menomonee Falls Chamber of Commerce. 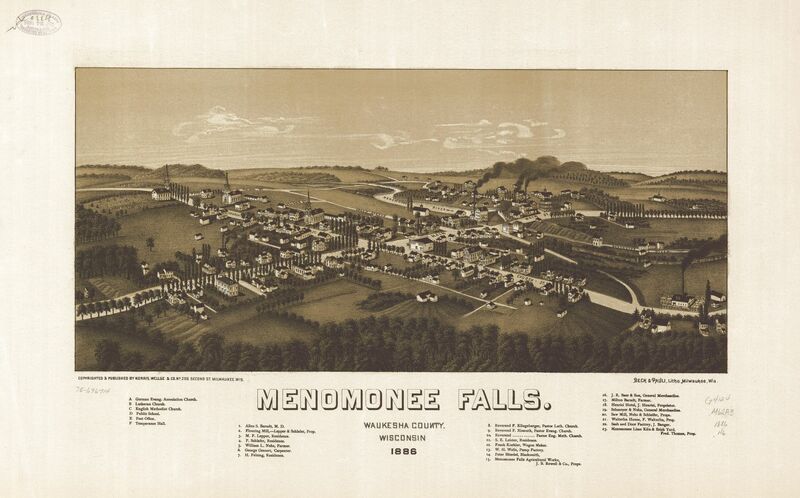 History of Menomonee Falls. Menomonee Falls: Menomonee Falls Chamber of Commerce, 1950. Strehlow, Helen Schmidt. My Menomonee Falls. Pulaski: COMMUNICATE!, 1988. Woll, Fritz Wilhelm. The Beet Sugar Industry of Wisconsin. Madison: University of Wisconsin, 1905.